° Allows you to save the output as a .WAV, .MP3, AAC, AC3, WMA, OGG, OPUS, etc. ° Allows you to quickly select different voices, even combine them, or juxtapose them in order to create dialogues between different voices. ° DSpeech integrates a vocal recognition system that, through a simple script language, allows you to create interactive dialogues with the user. ° Allows you to configure the voices in an independent way. ° Thanks to apposite TAGs, it allows you to dynamically change the features of the voices during the playback (speed, volume and frequency), to insert pauses, emphasize specific words, or even to spell them out. ° Allows you to capture and reproduce the content of the ClipBoard. 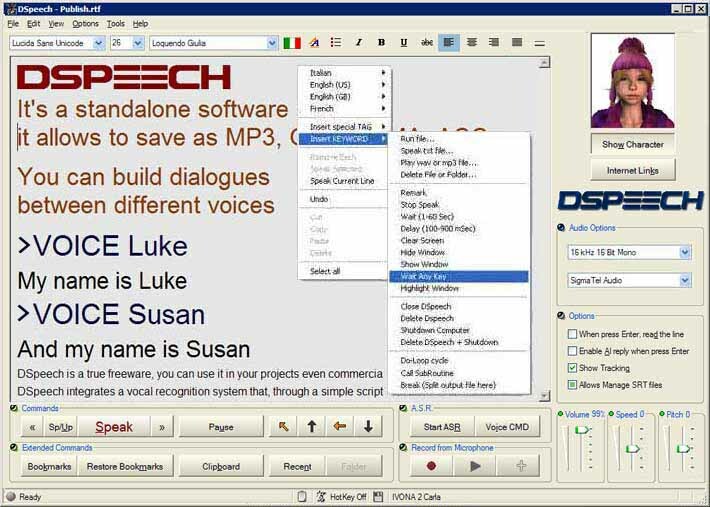 ° DSpeech is compatible with all vocal engines (SAPI 4-5 compliant). ° It allows to translate sentences between the main language and the language of the selected voice. ° AI dialog system. Not really useful, but amusing. It does not work in every language. ° It's able to dub movies; this feature synchronizes the reading subtitles (in the standard SRT format) with the playback of a movie. Player supported are Media Player Classic and later, and VideoLAN VLC Player. The most famous are Cepstral, Ivona, Scansoft, Loquendo, Acapela and VoiceWare. Voice Pack Full (Web) Here you find the package with the most beautiful voices. (These packages is not my work so that, for copyright issues, please contact the author). English (backup), Italian (backup), Spanish (backup), French (backup), German (backup). If you want to save in AMR format, you have to download the DSpeech AMR Pack from here and decompress it on the DSpeech folder. On Windows XP and later, if you want use SAPI4 voices, you must install SAPI4. Download it here (800 KB). On Windows NT4/2000/XP, if you want use the Speech Recognition features (ASR), you must install the MS-Recognition Engine as well. Download it here (30 MB). If your SAPI interface is broken and DSpeech can't work correctly, you can try to fix with one of this tools. ° Standard and timer sync. ° Transactional sync (by the journal of NTFS). ° Selective filter (you can exclude single files or folders). ° Start as Service (the program don’t needs to log in). ° Supports Symbolic Links and Hard Links. ° Supports Junctions and Mount Points. ° Log sent by Email. ° Backup of previous version of replaced files. ° Byte to byte compare. ° Supports multiple Jobs, each with it’s settings and sync paths. ° Minimum resource occupation (RAM and CPU). It is also possible to intercept a shutdown request, initiated by the user or an application, and to then execute the shutdown request with selected options from DShutdown. (For example: to simultaneously shut down all Lan PCs when the server shuts down). DShutdown doesn't force a power-off without logging off and saving settings. 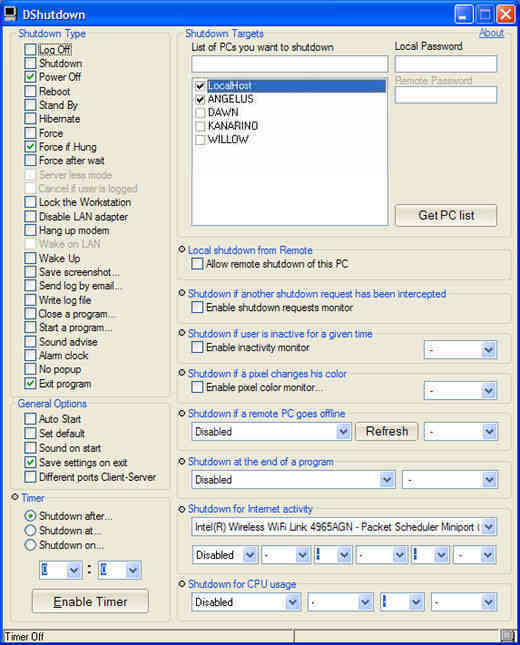 DShutdown instead provides a means to log-off, shutdown and safely power-off your PC. Administrators who use roaming profiles will appreciate the benefits of this feature. Double Finder is a program to search for duplicates, that is, duplicate files that take up unnecessary space on the disk. The program has a very fast algorithm that is able to quickly find all the duplicate files one or more times and present them in a detailed list. At this point it will be possible to examine them one by one or even delete them all at once. Practical experience has shown that often the elimination of duplicates can also free hundreds of GB on a medium HD, since practically all the HDs, over time, tend to accumulate unnecessary duplication of images, and multimedia files that can occupy also a lot of space. As usual, the program is stand-alone and requires no installation. Deep Explorer Deep Explorer is a tool very similar to the Windows Explorer, but it allows you to view and operate on paths much longer than canonical 260 characters of Windows. The length limit of the paths, which is normally limited to 260 characters, goes up to 32,000 characters. DExplorer allows you to recover, move and delete files and folders at this level of depth that is not accessible or erasable neither from Explorer nor from the Command Shell, which do not support this depth. Another interesting function is the Hard Delete which allows to gain a complete non-recoverable deletion even with undelete tools since both name and contents of files are overwritten with random data. The program is stand-alone and requires no installation. ° Three different ways to close a process, as the "termination request", the standard "forced termination" with dialogue tolerance, and the "forced termination" of any type of process, bypassing all permissions (it can also terminate running system processes). ° DTaskManager allows you to suspend and reactivate a process (as in Linux). This is useful, for example, to temporarily suspend a task that uses system resources when you don't want to terminate it (such as a DivX encoding process). ° DTaskManager allows you to select more than one process at a time, and terminate all of them "simultaneously". ° DTaskManager does not need any useless confirmation. HDHacker is a stand-alone micro-utility that saves, visualizes, and restores MBR or BootSector or any other specified sector from disk (works even with removable drives). An MBR and BootSector backup can also be useful for simple precautionary purposes too, since sometimes viruses or other OS setup (like Linux) could overwrite and/or alter the MBR/Boot Sectors, making it impossible to start up previous OS and/or access datas stored on the disk. HDHacker can provide "insurance"
against all these types of loss. DClean is a fast and light cleaning system software, it can free up several Gigabytes of disk space. The program has no interface and is very fast, so, it may even appear that you do not even start, but if you check the space on the hard disk "before" and "after" you will see significant changes. It should be run manually from time to time and it is wrong to automate every reboot, because it is TOO POWERFUL and could cause problems with automatic updates when performed during the same. 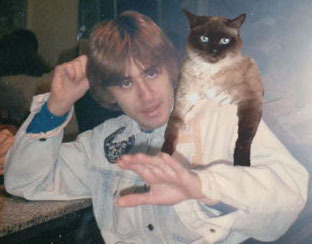 All my programs are completely free and will always remain free, if you are satisfied and want to help me and my cat to improve them or motivate the development of other features, any donation amount, however small, will be welcome and gratefully appreciated. I work hard to repay your support! Include on CD/DVD of computer magazines. Modify the packet, add or remove files. Modify any of the files.